Indiabulls Consumer Finance Limited (IBCFL), 100% subsidiary of Indiabulls Ventures Limited (IBVL) is opening a public issue of Secured Non-Convertible Debentures (NCDs) with a base issue size of ₹ 250 crore and an option to retain oversubscription of another ₹ 2,750 crore which is within the shelf limit of ₹ 3,000 crore on February 04, 2019. Allotment in the issue is on a first come first serve basis. 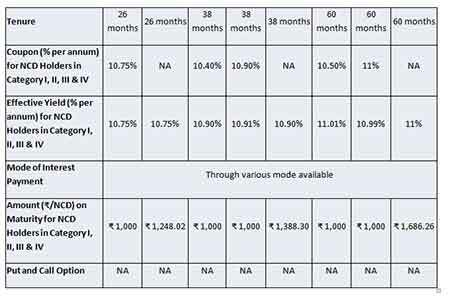 The NCD issue will have options of 26 months, 38 months, and 60 months maturities with an attractive coupon rate of up to 11.00% p.a., the minimum application size will be ₹ 10,000/-. These NCDs are proposed to be listed on both BSE and the NSE. For listed NCDs there is no TDS applicable when investors subscribe to them in Demat form. Indiabulls Consumer Finance Limited (IBCFL) is a non-deposit taking systemically important NBFC registered with the RBI and a 100% subsidiary of Indiabulls Ventures Limited, a listed company. IBCFL focus primarily on providing personal loans, business loans (unsecured SME loans and secured SME loans) and other loans. The Company has a diversified Assets Under Management of Rs 10,453 crores as of December 31, 2018 and a CRAR of 37.6% with a well matched ALM. IBCFL is serving over 6 lac customers and has a presence in 124 cities across India. DISCLAIMER CLAUSE OF USE OF BSE ELECTRONIC PLATFORM: It is to be distinctly understood that the permission given by the BSE to use their network and so ware of the Online system should not in any way be deemed or construed as compliance with various statutory requirements approved by the Exchange; not does it in any manner warrant, certify or endorse the correctness or completeness of any of the compliance with the statutory and other requirements; nor does it take any responsibility for the ﬁnancial or other soundness of this Company, its promoters, its management or any scheme or project of this Company. DISCLAIMER CLAUSE OF NSE: It is to be distinctly understood that the permission given by NSE should not in any way be deemed or construed that the Oﬀer Document has been cleared or approved by NSE nor does it certify the correctness or completeness of any of the contents of the Oﬀer Document. The investors are advised to refer to the Oﬀer Document for the full text of the Disclaimer Clause of the NSE. DISCLAIMER CLAUSE OF USE OF NSE ELECTRONIC PLATFORM: It is to be distinctly understood that the permission given by NSE should not in any way be deemed or construed that the Offer Document has been cleared or approved by NSE nor does it certify the correctness or completeness of any of the contents of the Offer Document. The investors are advised to refer to the Offer Document for the full text of the ‘Disclaimer Clause of NSE.